SAS Visual Text Analytics enables you to uncover insights hidden within unstructured data using the combined power of natural language processing, machine learning, and linguistic rules. This course explores the five components of Visual Text Analytics: parsing, concept derivation, topic derivation, text categorization, and sentiment analysis. Documents are parsed and analyzed to reveal dominant themes in the document collection. Sophisticated linguistic queries are constructed to satisfy specific information needs. An integrated solution is developed using information extracted from subject matter expert rules, combined with machine learning results for model and rule-based topics and categories. The course includes hands-on use of SAS Viya in a distributed computing environment. Use the point-and-click interface of Model Studio and SAS Visual Text Analytics. Explore collections of text documents to discover key topics. Identify key textual topics automatically in your large document collections. Create robust models for categorizing the content according to your organization's specific needs. Create, modify, and enable (or disable) custom concepts and test linguistic rule definitions with validation checks within the same interactive GUI. Extract individual instances of concepts from within documents. Create custom Boolean rules to categorize documents with respect to a categorical target variable. Modify automatically generated Boolean category rules. Extract a document-level sentiment score. Neither SAS programming experience nor statistical knowledge is required. You should be comfortable using a computer, have experience using browser-based software solutions, and have a basic understanding of the differences between structured (numeric) and unstructured (text) data fields. 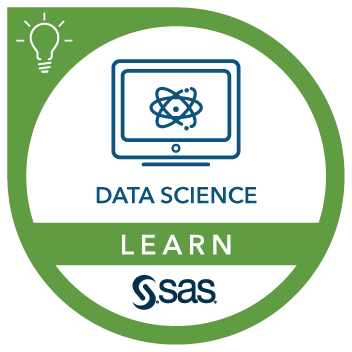 This course addresses SAS Visual Text Analytics software. Converting documents for analysis using SAS Data Explorer. Creating a project with no predefined concepts. Creating a project with custom concepts. Mechanics of machine-generated topics (self-study). SAS Visual Text Analytics rules. SAS Visual Text Analytics concept rules. SAS Visual Text Analytics demo category rules. Retrieving information about anxiety and depression from drug reports. Automatic categorization of ASRS incident reports. Retrieving mortgage complaints from the CFPB customer complaints data.